With the famed events entering their third round, Queensland received another southern boost from states below for the Gold Coast round of the ABT / Hobie tournament series. Stakes were gaining altitude rapidly with only 10 spots available (Five available here) before the penultimate event at Forster and the Grand Final in late March. 39 competitors gathered from far and wide to endure a frantic waterway left desolate before 8am, many had chances to pre fish the previous days prior with mixed results but from all reports gathered the viewing was a strong, good indication that the event would fire at will. The forecast was brilliant but overcast conditions were non existent which meant finding shade, cover and structure all in the one location the utmost priority. Game plans were openly shared and options discussed, the waterway loomed large but with enough avenues available it immediately split the field from first light. 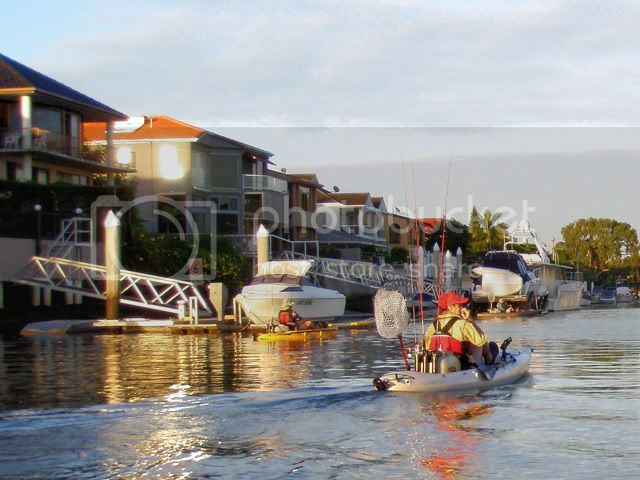 Many ventured towards the seaway while others stuck to the main Gold Coast strip and the Nerang river structure. The choice for many seemed difficult at first but with the ABT ‘Who shares wins’ policy in full effect, the highly visible Bream feeding so close to the launch site and the spoils of victory so close the scene was set for a tremendous round. Simon Goldsmith from ABT briefed the competitors before sending them forward to sculpt some winnings and earn a place in Tournament history. 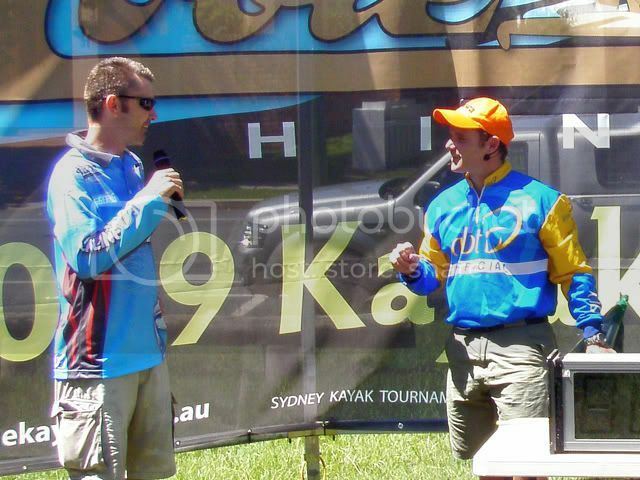 Sharing accommodation with Hobie Team Member Carl Dubois I was intrigued with his previous competitive Tournament experience and opted to tag along for the first hour, get some pointers and watch how the 2006 NSW Bream Open champion fashions his fish. Carl opted to work the shade early, leaving me generous spacing and the opportunity to pull fish from previously undisturbed locations. The waterway was still quiet and that brought misguided satisfaction, what was to come proved that while areas can be hammered by powered craft of all sizes, Bream could still be found using paddling stealth and the highly functional Hobie Mirage Drive. Hitting the shady moorings proved productive early; with near perfect tides a drift could be maintained whilst viewing upside Bream feeding. Cid landed an undersize Bream early on a plastic before moving off away from the ever increasing presence of competition, seeking shade no doubt. Certain plastics drew aggressive responses while others were ignored, Squidgy Wrigglers in Bloodworm colour, Powerbait T Tail Minnows and cut down Pumpkinseed Gulp Turtleback worms worked a treat. Another option I chose to follow was the pink Grubbing technique used by many AFC pros alike and as pioneered in Australia by ABT’s Steve Morgan. Worm hooks on 4lb braid and a striking style caught me additional undersize Bream, regardless of leader material, pauses or sink rates. While the fish weren’t big the result was exciting, sub surface grubs retrieved beneath cavernous shoreline concrete precluded a few big bust offs and some great tussles (Still painfully short of the legal minimal 23cm fork mark). Picking up undesirable fish of decent size would normally be considered trophy achievements and televised to all; these captures were kept off our chest and out of our minds. 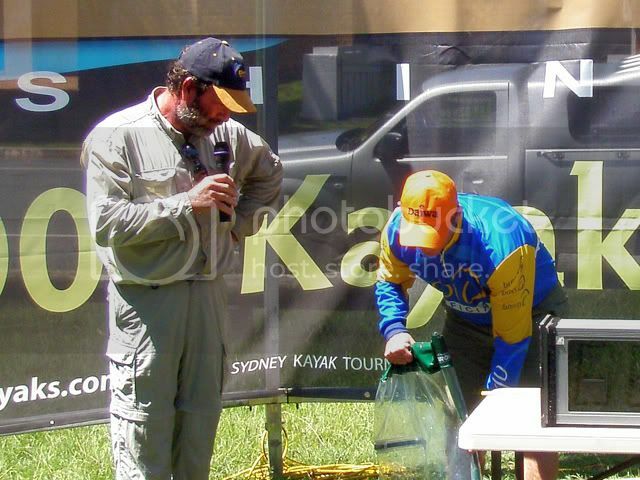 The focus of Bream kept many going strong, shallow weed beds, far fetched creek scenarios, rocky reefs and sandy beaches wore away the time with some success. Occasionally a bigger fish would be sighted but due to the abundant noise and lack of cloud cover they were spooked easily, if you could see them they could see you. Eventually time was up and entrants returned with some stories to tell, lost rods, nets and a hard days fishing all round. Tales of woe aside, some legal fish were caught and on varying techniques (Including surface, sub surface, plastics and popular hard bodied presentations). 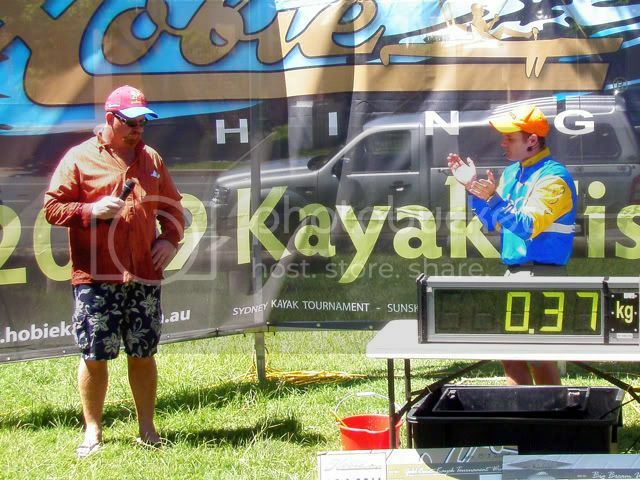 A total of nine fish were presented for weighing between eight anglers with one lucky, well travelled character bagging not only the two fish limit, the tournament win but also the coveted ABT / Hobie Angler of year (AOY) title. 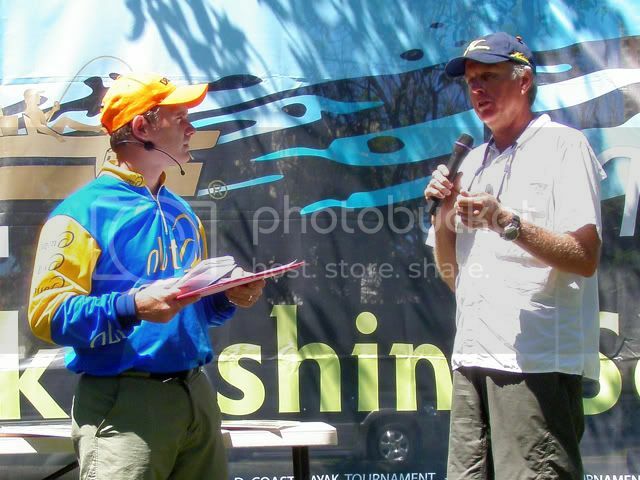 Rounding out the top five, Hobie’s Steve Fields secured $90 and a Daiwa / Berkley prize pack for .350gms. 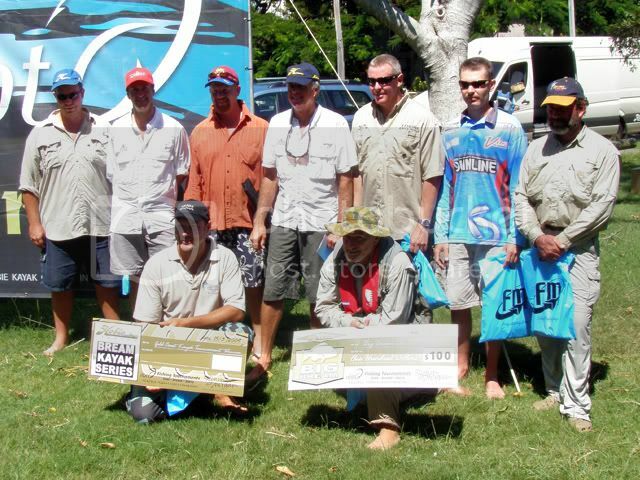 Fourth place went to Barry Trap, $90 and a Ecogear prize pack / Team Daiwa Advantage 3 rod for his 0.370gm effort. 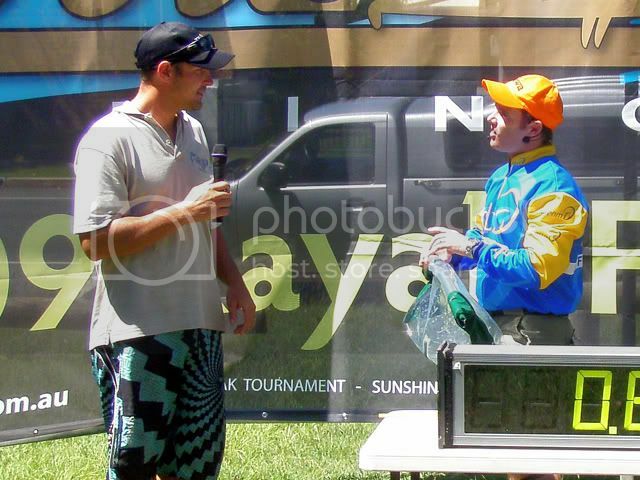 Hobie State Team Member Carl Dubois took out third place, $130 and a Ecogear prize pack / Team Daiwa Advantage reel. Brian Rutledge took out the big Bream $100 award with his .490gm beast; $220 for second place, a Berkley / Ecogear Prize pack and a Team Daiwa Advantage 3 rod. 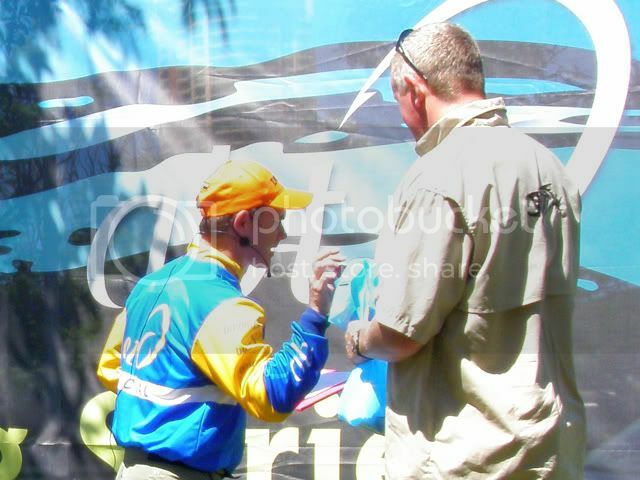 The winner was the now ABT / Hobie Tournament favourite Greg Lewis from Burrill Lake on the New South Wales South Coast. 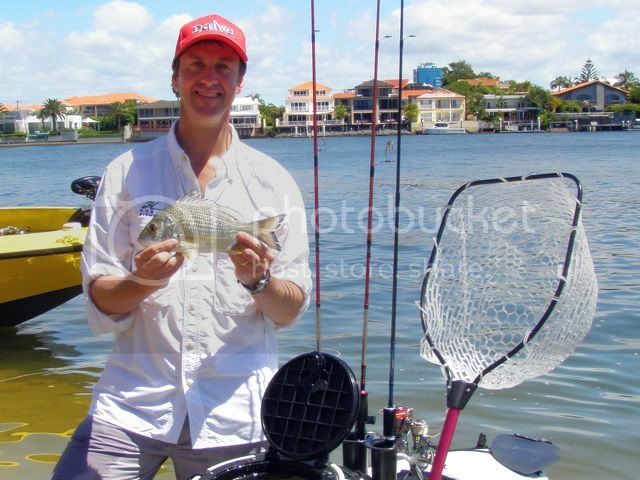 Greg’s two fish .680gm limit was well deserved and earned himself $350, Hobie Sunglasses and some Berkley Fireline. Due to Greg already qualifying for the Grand Final (Along with Steve Fields), both sixth place Dave Hedge and seventh place Micheal Maas were both bumped into the top five to qualify and find themselves in contention to take out the final series (A fitting result). “Firstly I have to say how tough I thought the fishing was. I'd heard good reports from other anglers that had pre-fished but I guess the hot, still conditions (as well as the thousands of boats motoring around) weren't conducive to a good bite. The day started okay with two just undersize fish and an absolute roasting from something big within the first half hour but after that I couldn't even get a take”. 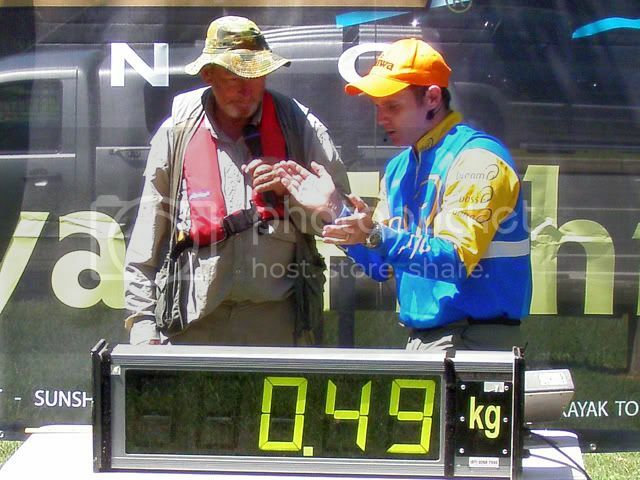 “It was two hours before I hooked my first decent fish from under a pontoon near Paradise Island and he fell to a Berkley Gulp 2" shrimp in banana colour that was rigged on a 1/16th oz jighead. When I had him out in the open I could see he was barely lip-hooked so I backed the drag right off as I inched him closer to the kayak. As I slid him towards the net, he gave one last wriggle and voila, he was gone! That really hurt losing that guy as the bites were so few and far between”. “I tried everything in my arsenal; hard bodies over the flats and along rock walls, blades down deep near bridges and soft plastics on long leaders under overhanging trees and every jetty and pontoon that I came across. 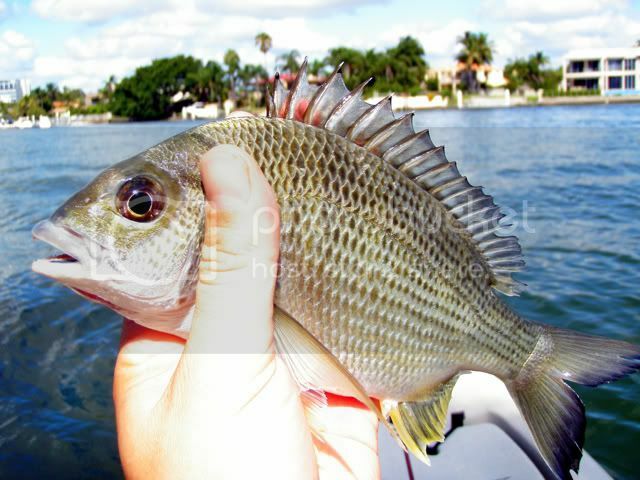 Finally, at 10:45 am, I hooked a nice bream that I guessed would go about 28 cms to the fork. Those next 2 minutes were pretty nerve racking as I took my time and eased him into the net. Not taking any chances, I even went ashore before putting him in the livewell to minimise any risk of him wriggling out of my hands and back into the drink”. “It was such a relief to get that 'donut monkey' off my back and I'll admit that I'd probably started to fish a little too fast as I'd anxiously watched the minutes tick by. I calmed right down and was getting my casts back into the zone and only ten minutes later I was busted up again by something too big for the 4 lb leader. That was it and I had to floor it to get back by 12pm”. 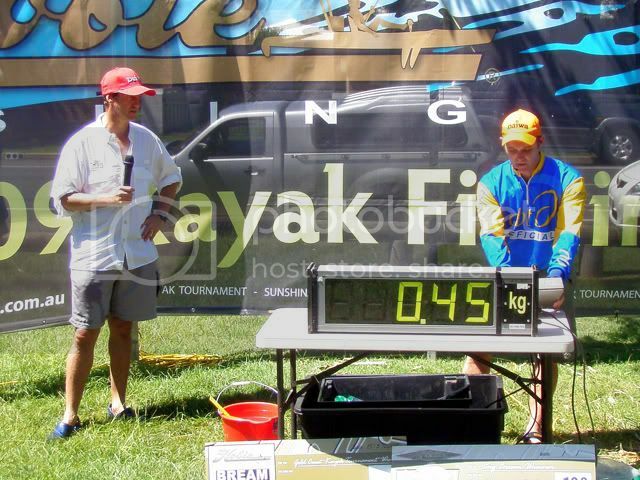 “I was sure that one fish wouldn't be enough to get me onto the podium but while waiting to weigh-in, the banter amongst the other competitors was one of hard luck stories and a lot of Krispy Kremes. 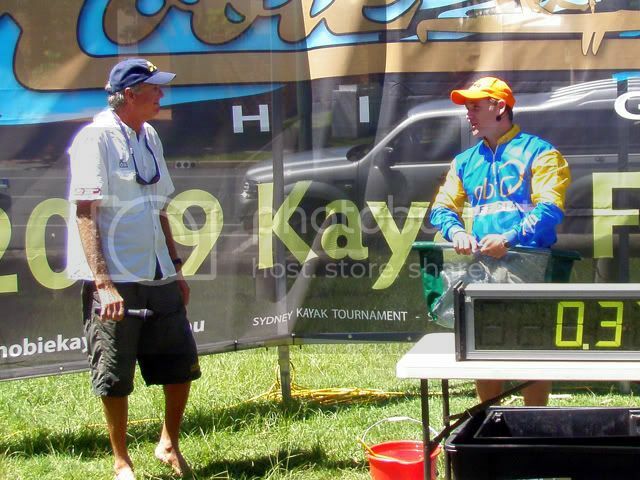 Luckily, that one fish was enough to see me take third spot and get an invite to the Grand Final at Forster. To say I was over the moon would be an understatement and I can't wait to spend two days fishing in another new arena. Looks like I'll be pouring over a few new maps”. How do yo guys turn around and access the live well behind you on the water ? Adding fish into the livewell is quite easy as long as you have a good grip on those Bream. 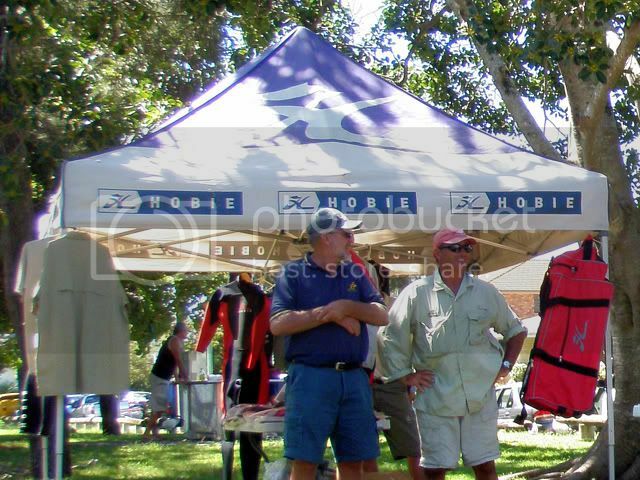 Hobie kayaks are quite stable and allow siting on side with feet in the water ( Some people even stand on them! ). As the livewell is close to the back of the seat some body shuffling can get you to the twist and stow hatch which from there is an easy affair. These livewells are the goods and after only seeing one Bream deemed 'Unfit' due to a broken battery I cant reccomend them enough. Mines being used for Podys in the off season!